Heartstring is a very sweet bear. He is 20" tall and made from an apricot colored mohair with a dark back. 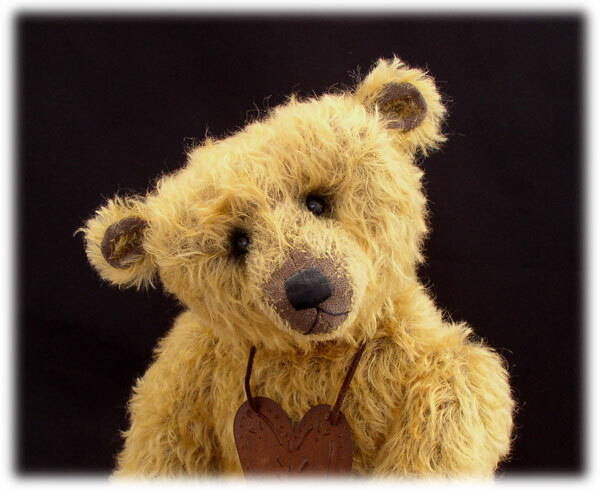 He has antique shoebutton eyes, a waxed nose and wool felt paw pads. He has been hand distressed to give him an aged look. Heartstring's paw pads and face have been airbrushed to deepen his expression and character. Heartstring comes wearing a rusted tin heart on a leather necklace. 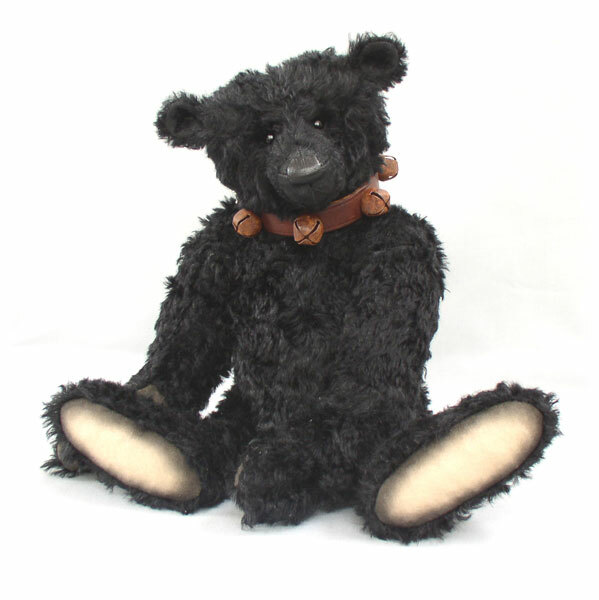 Black Jack is a black Antique style bear with a center seam design, a prominent hump back, and long arms for giving great hugs. Black Jack's fur is a rich black curly mohair. He is 17" tall and has German glass eyes, a waxed nose and black perle cotton mouth and claws. His paw pads are made from wool felt and have been lightly airbrushed. Black Jack is fully jointed and stuffed with excelsior and pellets to give him some weight. His body is also under stuffed to give him that slouchy, lovable old bear feel. Black Jack is wearing his favorite leather bell collar. Hudson is a handsome bruin who loves to sail and enjoys the outdoors. 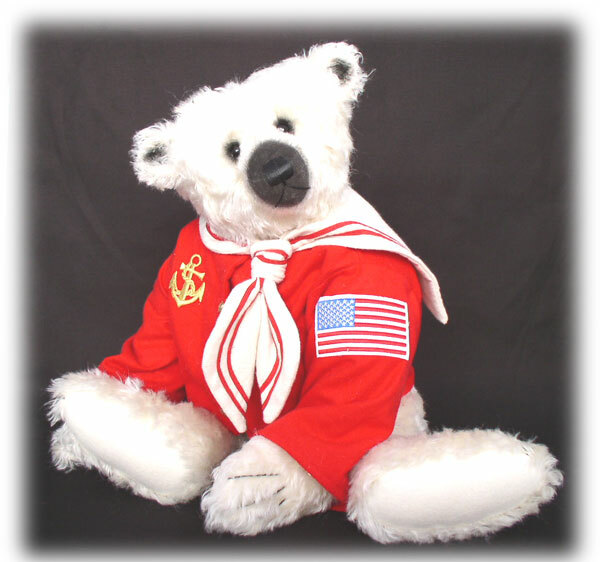 He is a 22" sailor polar bear with a center seam design, a prominent hump back, and long arms for hoisting the sail. Hudson's fur is a beautiful off white, vintage looking mohair. He has antique shoe button eyes, a waxed nose and black perle cotton mouth and claws. His paw pads are off white wool felt. Hudson is fully jointed and stuffed with polyfil and plenty of pellets to give him considerable weight. His body is under stuffed to give him that squishy, huggable, "cuddle with me", feel. I have also airbrushed some of his facial features and ears to accentuate his character. Hudson is wearing his favorite sailor jacket and collar, both of which are made from cozy flannel. 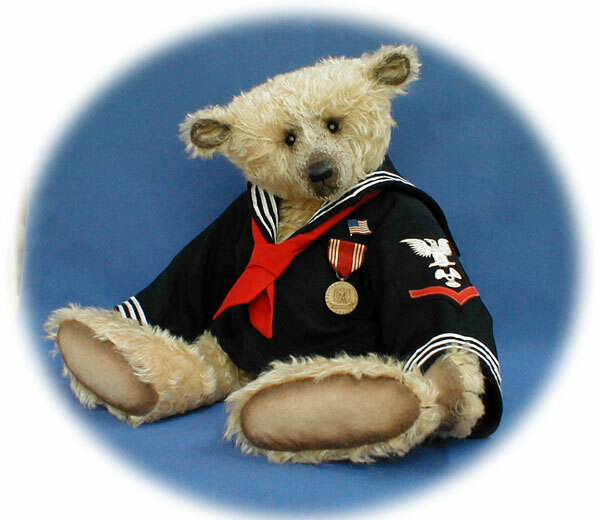 McAlister is a sweet 22" sailor bear. His is made from golden tan mohair with wool felt paw pads. McAlister has a center seam design, a prominent hump back, and long arms just like the bears of the past. He has been hand distressed to give him the appearance of being well loved over the years. McAlister sees through antique shoe button eyes, has a waxed nose and black perle cotton mouth and claws. He is fully jointed and stuffed with excelsior and pellets to give him considerable weight. His body is also under stuffed to give him that slouchy, lovable old bear feel. I have lightly shaded and airbrushed some of his facial features, paw pads and ears. McAlister's sailor shirt has been especially designed for him. It is made from a wonderful navy wool fabric and has white trim and a vintage navy rate patch on the left arm, just like an authentic sailor shirt. McAlister is also wearing an old medal for good conduct and a U.S.A. flag pin. Twinkle and his best friend Rags love to star gaze. They have fun staring up at the sky trying to find the constellations. The two of them are always ready for an adventure and can't stand to be separated. Twinkle carries a pillow around for a comfy place to rest their heads. He also always wears his nightcap. He has a tendency to fall asleep at odd hours due to his late night star gazing, therefore he finds it convenient just to leave his night cap on. Twinkle wears a rusty star around his neck to display his passion. 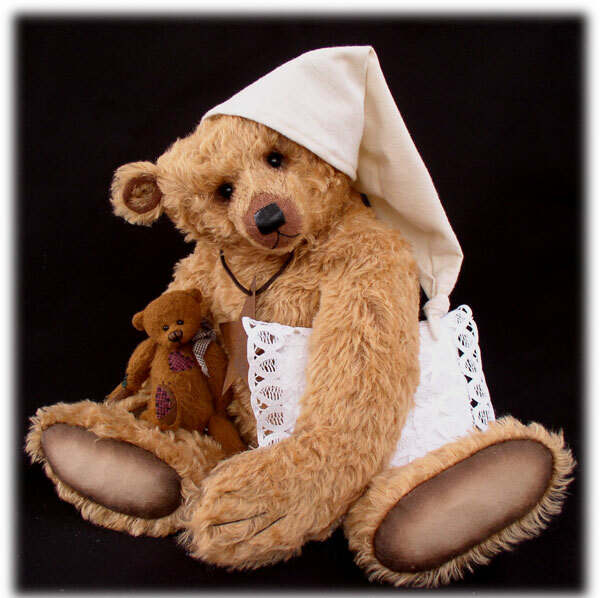 Twinkle is an antique style bear with plenty of charm. He has a center seam design, a prominent hump back, and long arms for giving great hugs. Twinkle is made from a beautiful light cinnamon mohair. He is 22" tall and has premium glass eyes, a waxed nose and black perle cotton mouth and claws. His paw pads are made from wool felt. Twinkle is fully jointed and stuffed with excelsior, and pellets to give him significant weight. He is also under stuffed to give him that slouchy, lovable old bear feel. I have airbrushed some of his facial features and paw pads to accentuate his character. Twinkle's best Friend Rags was purchased and is a Cottage Collectible by Ganz. He has wobble joints and patches all over from all the love he has received. He comes with Twinkle as they are best buddies.